Ah Beacon Fell! What a lovely, little hill. Seen from miles around, hunkered down amongst the skirts of its older sister Parlick (no road up Parlick, otherwise you’d be going up it……..), this little lump is the favourite of those who venture out “into the country” with their dog and trainer boots for a 10 minute slog from the car park to the café on its lower slopes for a sausage barm dripping in fat. Yes, Bacon, sorry Beacon Fell is where urban man communes briefly with nature before returning stinkily back to his crack den with his cliché dangerous doggie (a tubby little staffie with half its teeth missing and a predilection for crapping behind the telly) and a trail of congealed fat on his unshaven chin. However, these randommers, who often emerge clueless and dithering on the road in front of Beacon Fell’s brave Strava segmenteers as they cane it down the hill’s southern side on another totally futile crown mission, make up only a tiny percentage of the denizens of places such as Preston and Blackpool. For the most part this little topographical anomaly merely represents to them something to be pointed at in bemusement over the shoulder of their latest victim. So, what interest does it hold for you Leadlegs? Well, Beacon Fell is where the infamous “last bit” of the Badass begins. Rounding the hillside you are only 5 miles from the safety and comfort of Garstang (and you begin to encounter a series of signs that handily point this out to you as the route takes you past them), yet you still have 22 miles to go of wiggling and jiggling in the righteous fire like a burning bug on a stick. You have passed beyond the realms of physical torture, and now to be truly considered a Badass you must plunge into the hope skewering realm of pure spiritual torment. It might be dark by the time you get here, but nothing can be darker than the pain cave inside your head. Stravasaddoinfopoint: The climb segment up to Beacon Fell is called Rigg Lane (http://app.strava.com/segments/876064), and it is one of the favourite entry points to Beacon Fell because you pop out at the top and then can gun down the hill like a complete loon, scattering walkers, pheasants, lost children, and nocturnal doggers like fluttering, inconsequential confetti tossed blindly uncaring on the marriage day of space and time. 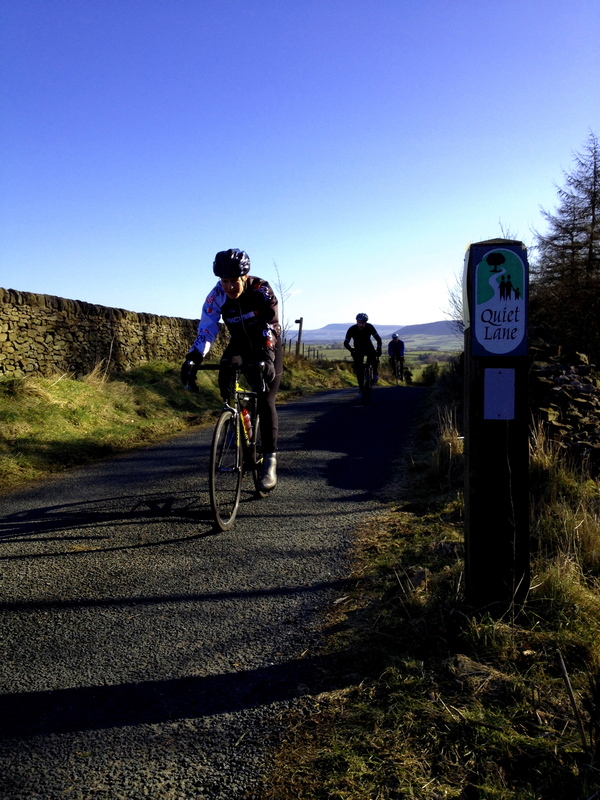 Posted on May 22, 2013, in Bowland Badass Climbs and tagged Beacon Fell, bowland, Bowland Badass, Bowland hills, Cycling, Route. Bookmark the permalink. Leave a comment.